Kwakwaka'wakw Tribe (Kwakiutl), British Columbia, Canada. Red cedar, native and trade pigments. Provenance: A Private Canadian Collection, Vancouver Island, B.C. An essay by Steven Brown, former Curator of Native American Art at the Seattle Art Museum, is included with acquisition of this piece, and can be read by request by interested parties. The bear is an early and important clan crest emblem within the Kwakwaka'wakw Tribe, as well as a symbol of high status and respect of its power, reflected in dance, song, and story. 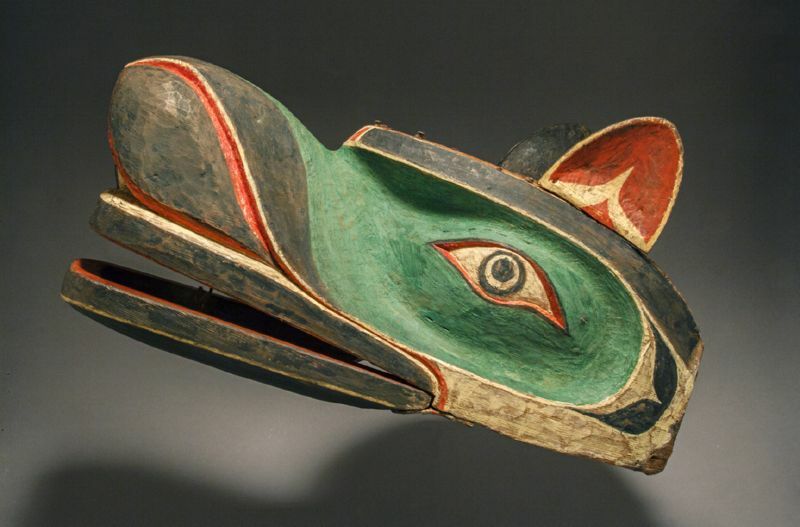 The black, red, and green pigment indicates an earlier date of creation of this mask. Later carvers used a white background. The lower jaw can be manipulated by movement of the wearer's chin. All pigments are original to the mask, with the exception of the lower jaw.